Click the "Home" tab on our web page, then click the "Use The AD Toolbox FREE For 10 Days" box. Signing up will give you full access to the AD Toolbox online FREE for 10 days. Do I need to use a Specific Internet Browser? The AD Toolbox online is compatible with all browsers including Firefox, Google Chrome and Internet Explorer (for PCs) and Safari (for Macs). Please keep in mind that there are differences in all browsers and the method to download or print from our website may differ slightly from browser to browser. The program will also run on smart phones and tablets. It is also important that you enable cookies on our website as certain functions in reports and forms require cookies to work properly. How do I Create AD Compliance Reports? Go to "AD Report" > "Create New AD Report"
After logging into the Member Dashboard: Click AD Reports > Create New AD Report. Or go to the "My Reports" Section and click the green "New Report" button. How do I Save my Work in AD Reports? Click the Green "Save" Available on Every Line of the Report. The "Save" saves all changes to each and every AD record in your report. Be sure to save before leaving the report to view the text of an AD. Can I delete or duplicate an AD inside my report? Yes, use the red and blue buttons at the top of the report. Be sure to click the "Select AD" checkbox next to each AD and the click the blue Duplicate or red Delete button at the top of the page. If I open a Report from Last Year, how do I Check for New ADs for That Specific Report? Under "Report Options", Choose "Update with New ADs"
When you open an existing AD report, there will be a "Report Options" drop down available on the left with three choices: Update with New ADs, Make a Copy of Report, and Delete Report. Choosing "Update with New ADs" will duplicate the report, automatically adding any new ADs that came to be since the date of the existing report (If you hover over an item a pop up will describe what each choice will do). Any new ADs will be marked with a "gold star" so you can easily identify them. New ADs that are automatically added will be for the Airframe, Engine(s), and Propeller(s) in the report as well as all Appliances. The Appliance ADs can easily be deleted if they do not apply. Why is my Printed Report not Fitting the Page Properly? The above printing page size issue is related to handling the page within the pdf file itself. For example, on a Mac in Safari after the "pdf" is created and showing in your URL one cannot print properly from there. In addition you still need to hover close to the bottom of the (Safari) page and click one more time to open an additional "true pdf window" outside of your browser window. For another example, in Firefox (on a PC) after the pdf is created and showing in your URL, you cannot print properly directly from there either. You need to click the "Download" icon (located just to the right of the print icon) to open an additional "true pdf window" outside of your browser window. How can I View Service Bulletins/Documents? When viewing an AD, click the link on the left for "Service Documents" (and other related documents like Advisory Circulars, FARs, etc). OR ... From the dashboard, click the "Service Documents" link to open the Service Document Directory / Service Document Locator and search for them by Aircraft Model, Manufacturer, or Document Number. How do I view All Available Information related to my aircraft? When you search for an airframe, you have a choice to view a list of related ADs (from which you can create your AD Compliance Report), or you can see all related information for your airframe by clicking "Nfo". Nfo will show you related TCDS, suggested engines and propellers, ADs, SBs, and STCs. Nfo is also available through the FAA Aircraft Registry. If Nfo is available, you will see the blue "Nfo" button directly under the tail # of any aircraft registry record. 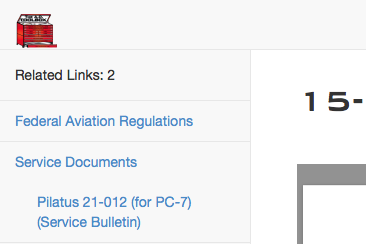 You can also click the blue "Nfo Airframe Info" on the left when in the AD Report section. How do I Add or Change my IA Certificate #? In the Members Dashboard, go to the Profile section and click the blue "Change Cert". Then enter the IA Certificate # into the Cert# field and click the blue "Change" button. Can I Change the Technician Name on the report for an individual AD? Yes you can. Go to the specific line in a compliance report for any individual AD and enter the alternate "Name" and "Certification #". Be sure to click the green "Save Report" button after your changes have been made. How do I get my IA Name and Cert # to appear on every AD line in my report? Click the blue "Edit Heading" line at the top of your report. Click and add a check mark in the check box to the left of "Add selected IA to all AD Records". Then click the green "Save Changes" button to update all the AD lines in your report with the selected IA information. How do I Create an AD Compliance Report for Experimental Aircraft? Go To AD Reports > Create New AD Report just like you would for any other Make & Model Airframe, and search for "Exp" in either the Manufacturer or Model search field. Then click on 'View AD List (0)". Click "Create Report" and you will have a customizable report ready to enter Engine, Propeller and Appliances into. How Do I Contact a Person for Assistance? 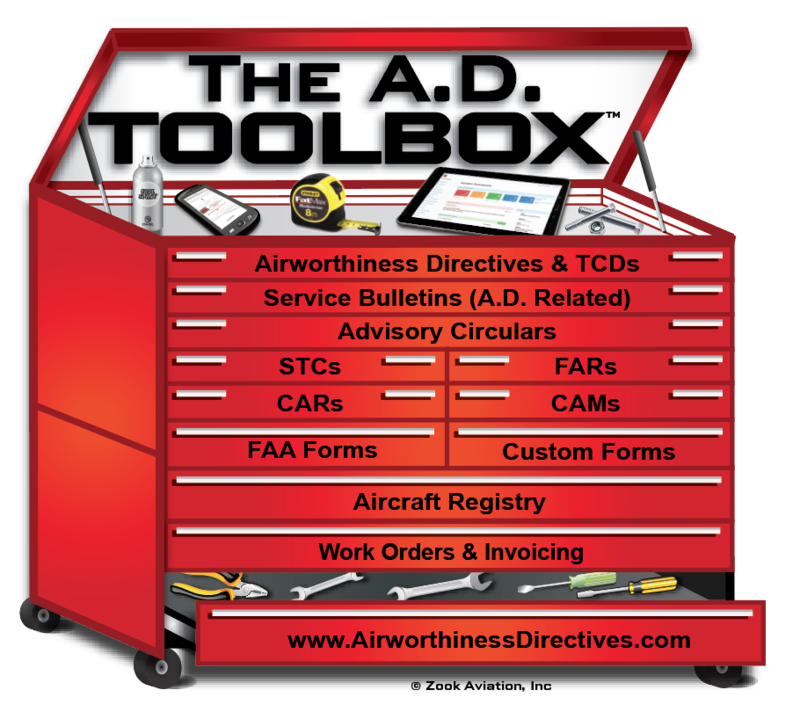 Email assistance is available at Support@AirworthinessDirectives.com. Our office phone number is (540) 217-4471 and usually answered live from 9 AM to 5 PM Eastern Time Mon - Fri (more like 8 AM to 6 PM ).